Inspired by the traditional Japanese multi-purpose knife, the Peugeot Santoku knife, with its ideal balance and perfect handling, fulfils three essential functions in the kitchen: cutting, slicing and chopping. In Japanese, the Santoku knife could be translated by the "three virtues" knife, summarising its use for cutting, slicing and chopping, and the three types of food for which it is particularly suitable: meat, fish and vegetables. 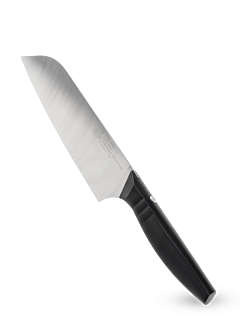 With a steel alloy blade containing 16% chromium and offering unprecedented resistance to corrosion, the Santoku Japanese knife is the equivalent of a chef's knife. Its wide blade, with a 22° cutting angle, is slightly curved creating a pleasant, fast and efficient rocking movement. Its alveolated design allows the creation of air cushions between the blade and the ingredients during cutting, to prevent food from sticking to the blade. The Santoku knife is specially designed to slice fish, in particular oily fish, vegetables, herbs and meat very finely and precisely. A truly versatile knife, designed in the purest tradition of fine cutlery, intended to simplify and enhance the cook's use and movements, the Peugeot Santoku knife is suitable for both professionals and keen cooks.